Welcome to Summit School District Facilities Department. 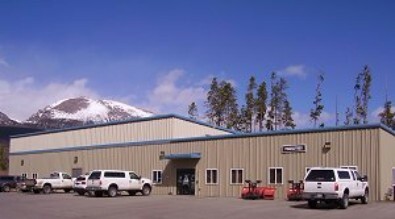 Our office is located at 107 School Road in Frisco,Colorado, and we are responsible for the upkeep of all district facilities, athletic fields and learning spaces. Our department is committed to working with all Summit School District students, staff and the community in an atmosphere of care and respect. Everyday, we strive to offer each student a safe and comfortable school setting. We will help in whatever way we can to promote every student developing as a lifelong learner and responsible citizen. Our goal is to provide the resources necessary to create the best learning environment possible for Summit County kids. 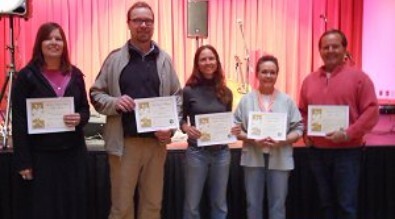 Woody Bates, Facilities Manager at Summit School District received the Organic Fertilizer Award from the Green Scene Aware Committee during the Earth Day Action Fair in Silverthorne on April 19, 2012. Woody was awarded this recognition because he is an educator in our community who inspires community members to take proper care of the planet. He received this award by unanimous decision for his hard work "greening up the schools". Congratulations, Woody! Summit School District has a reinspection & management plan to satisfy requirements of the Asbestos Hazard Emergency Response Act (AHERA) part 40 CFR 763.93. The complete management plan shall be made available to any person requesting a copy. Management plans are available at each school or district building that currently has, or has had in the past, asbestos containing materials (ACM) on the premises. Mudded joint packings on fiberglass insulation and cementitious panels at Central Administration. Mastic (glue) under floor tile at Dillon Valley Elementary, Frisco Elementary, Breckenridge Elementary. Dillon Valley Elementary boilers and boiler room pipe insulation. Mastic (glue) under floor tile and floor tile at in the gym and stage areas at Dillon Valley Elementary and Frisco Elementary and from the stage area at Breckenridge Elementary. NOTICE is hereby given that Summit School District RE-1, in accordance with the United States Environmental Protection Agency’s Asbestos Hazard Emergency Response Act, has completed federally mandated asbestos inspections of its facilities and that Asbestos Management Plans are available for public review on the Summit School District RE-1 website or by contacting the Summit School District Facilities Department.